Conflict and hunger in South Sudan has forced one million people from their homes. Almost five million people are facing severe food insecurity in South Sudan, according to the United Nations World Food Programme. In the world’s youngest country, years of civil unrest have displaced large segments of the population—many of those displaced are small-scale farmers. Forced to leave their farms and livestock, the conflict has left people unable to cultivate their land and grow food to feed their families. 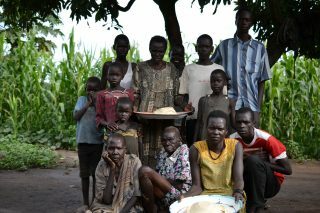 Responding through Canadian Foodgrains Bank, PWS&D is helping to provide nutrition support to those affected by famine conditions in South Sudan. Nutrition feeding centres have been established, where children under five and lactating mothers can be screened for malnutrition. If a child is found with severe acute malnutrition—meaning they are so malnourished they are close to death—they receive treatment with therapeutic foods. Lactating mothers and children with moderate acute malnutrition are being treated, and caregivers are being educated in proper hygiene and child feeding practices. The project will benefit 42,000 people. 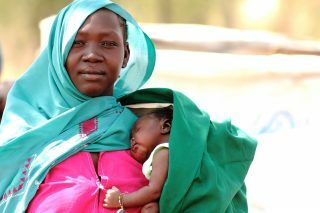 Pregnant and lactating mothers, as well as children under five are being screened and treated for malnutrition. Also in collaboration with partners at Canadian Foodgrains Bank, PWS&D is helping support emergency food distributions for 13,500 individuals (approximately 2,250 households). Families will receive monthly distributions of sorghum, beans, oil and salt. Distributions will prioritize households who were unable to harvest last season, women or child-headed households, households with malnourished children, pregnant and lactating mothers, the elderly and people with disabilities. With support from the Government of Canada through Canadian Foodgrains Bank, donations to this project are matched 4:1. That means that for every $1 you contribute, $5 of programming can take place. Please give today. In other parts of Africa, El Niño related weather events endure, prolonging drought and leaving millions more facing severe food insecurity. Read more about our ongoing Africa drought response. *These projects receive support from Canadian Foodgrains Bank. PWS&D is a member of Canadian Foodgrains Bank, a partnership of 15 churches and church agencies working together to end global hunger. This project is undertaken with matching support from the Government of Canada.